An easy-to-fit low water content spherical soft lens manufactured using the patented "Reverse Process III" or cast molding technology, and designed for use in the correction of myopia and hyperopia on a daily wear or extended wear basis. Extremely low center thickness provides good oxygen transmission, while an increased mid-peripheral thickness allows good handling across the power range. Replacement schedules should be determined by eye care practitioners in consultation with their patients. 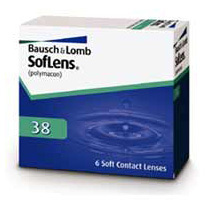 The SofLens®38 is available in 6-packs. Specially made for the correction of myopia and hyperropia on a daily wear or extended wear basis, the Soflens 38 (formerly called Optima) is designed with an easy-to-fit low water content spherical soft lens using the Reverse Process III. Its extremely low center thickness provides good oxygen transmission while an increased mid-peripheral thickness allows good handling across the power range. Vision correction has never been so simple and comfortable. Please note: SofLens®38 contact lenses were formerly marketed as Optima® FW contact lenses. Patients who have an established prescription for Optima® FW contact lenses can be dispensed SofLens®38 lenses with no additional fitting required. daily wear , monthly disposable (30 days). 38% water content, 6 pcs per box.